This post is by Ben Hodges, from WHOI. Surface currents in the world’s oceans are like highways, transporting nutrients, plankton, and other water properties, and are part of a changing, coupled climate system. In order to understand how different parts of the ocean are connected, to predict the events we might expect in the future, and to monitor the changes our planet is undergoing, we need to map these surface currents. Drifters are oceanographic instruments designed to accurately measure surface currents by mimicking the motion of a single parcel of seawater. A drifter is composed of two parts: a surface float containing a transmitter, and a drogue, hanging below, which is a hollow tube of canvas 60 cm in diameter and a few meters long. 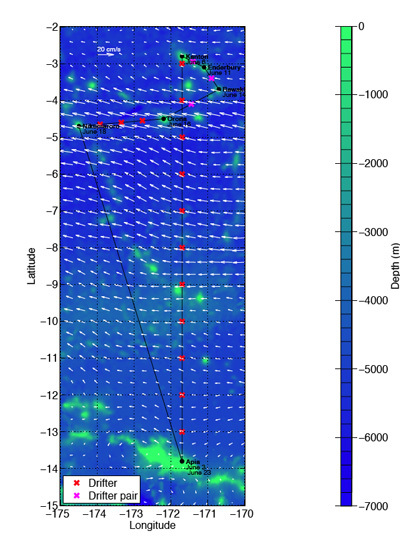 The transmitter regularly relays the position of the drifter to scientists on land via satellite, and the drogue ensures that the drifter accurately follows a water parcel, unaffected by the wind above. A drifter can continuously report positions for approximately two years. 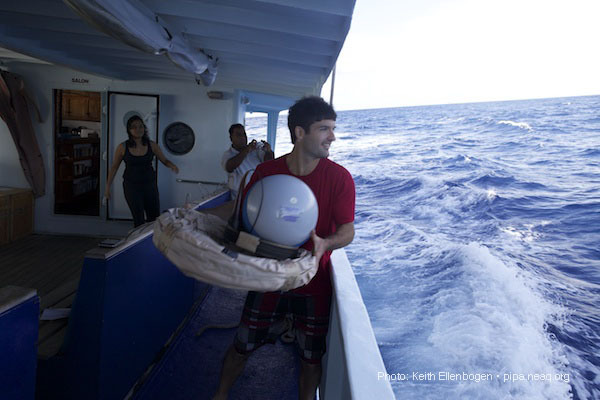 During the 2012 PIPA cruise aboard the NAI’A, several drifters will be deployed along the eastern rim of the Phoenix Islands archipelago. The prevailing westward current will likely carry these drifters near downstream islands, providing multiple realizations of the paths taken by water (and everything suspended in it) as it flows from island to island. With these current measurements, we hope to better understand how the transport of biota influences the connectivity of the islands’ ecosystems. 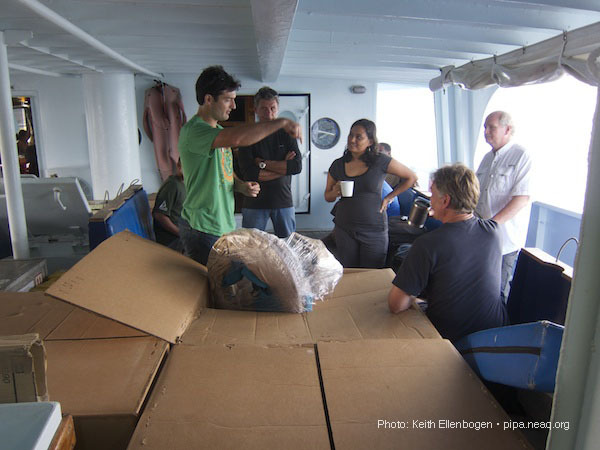 The PIPA cruise also provides a unique opportunity to study ocean currents over a broader area as well. 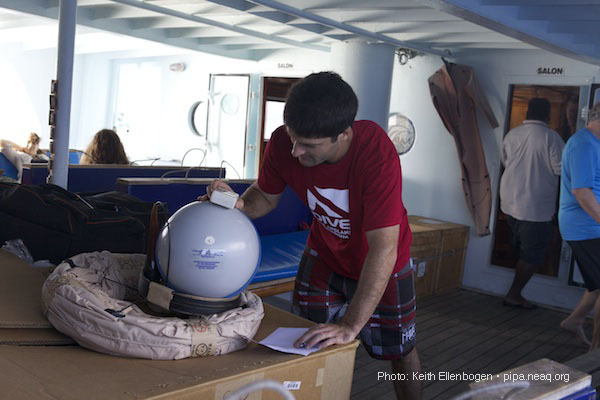 Drifters aren’t the only game in town when it comes to measuring surface currents. By observing sea surface height from satellites, scientists can estimate surface currents over most of the globe (a relationship known as geostrophy), without ever leaving their cozy offices. But there’s no substitute for drifters when it comes to accurately following a parcel of near-surface water. and the planned arrival date of the NAI’A at each site.